"And that's the way it is ...."
Will anyone say it with such assurance again? Goodbye, Walter. Image: O'Halloran/Library of Congress [VIA PINGNEWS]. Network news anchors still aim for that mix of eloquence and authority that Cronkite embodied, but they compete, at a disadvantage, with the noise of an ascendant punditocracy and the mountain-from-molehill nattering of cable news organizations that live on crises -- it's not the old voice of reassuring honesty that they cultivate, but one of perpetual anxiety. There are many more rooms in the mansion that is television news nowadays, but they have grown proportionately smaller; they are no longer fit for giants. Thanks to Ben Whitford in Slate for the link. 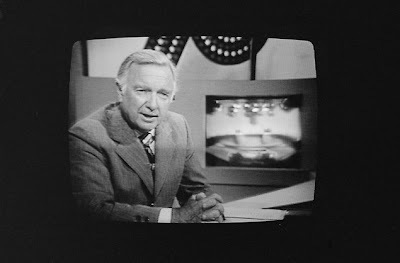 Second update: Here's an appreciation of Cronkite by Verlyn Klinkenborg in yesterday's New York Times. Manohla Dargis on Harry Potter yields a magnificent Alan Rickman simile. [T]he sensational Alan Rickman ... invests his character, Prof. Severus Snape, with much-needed ambiguity, drawing each word out with exquisite luxury, bringing to mind a buzzard lazily pulling at entrails ...."
Back in April, I posted a video I made of Charlie Gracie doing a song called "I'm All Right" at the Roots of American Music Festival at Lincoln Center in the summer of 2007. As I noted in the text accompanying that clip, Gracie was the first to record a song I heard many times when I was in sixth grade (1957-58) in a cover version by Andy Williams, "Butterfly". The clip above shows Gracie singing that song on the Ed Sullivan Show in 1957. Yes, my dad had the original rock n roll version of BUTTERFLY--which went to #1 on Billboard in the spring of 1957. Andy Williams' cover also went to #1--so this was a monster hit. My dad was and is--Philly's very first rock n roll star... was the first hit artist on the Cameo-Parkway label based in Philly. Dad was also the first solo U.S. rock star to tour the United Kingdom--after Haley's Comets. He's been playing there almost everyear since--and will go there this fall too--including shows in Ireland! Dad is currently working on a new cd with Graham Nash, Al Kooper, Peter Noone, Keb Mo, Albert Lee and Dennis Diken--several artists he inspired early on. Paul McCartney, Van Morrison, Ray Davies and the late George Harrison were also fans. Paul did a cover of my dad's second biggest hit: FABULOUS in 2000. It went to #16 nationally for dad in 1957. He had 5 Top 30 hits in England--including Wandering Eyes, I Love You So Much It Hurts and Cool Baby. He made his first record in 1951 when he was just 15 on the Cadillac Label out of NY. Dad got his start on the Paul Whiteman radio/tv show. Dad's release of BOOGIE WOOGIE BLUES in 1951, is considered one of first rock n roll songs ever released by a white artist--even though the term hadn't officially been coined yet. Still, Charlie Gracie was making records in a rockabilly vein 3-years before Elvis, Buddy Holly, Eddie Cochran and Jerry Lee Lewis had even stepped into a recording studio! PBS aired a documentary on my dad in 2007: CHARLIE GRACIE: FABULOUS! which is still available at www.oldies.com as well as his Best of Charlie Gracie cd--containing all his original chart hits. Thanks, Charlie Jr. I'm looking forward to hearing your dad's new CD.